Download "The Act imposes foreign exchange restrictions, i.e. performance of certain actions requires a relevant foreign exchange permit." 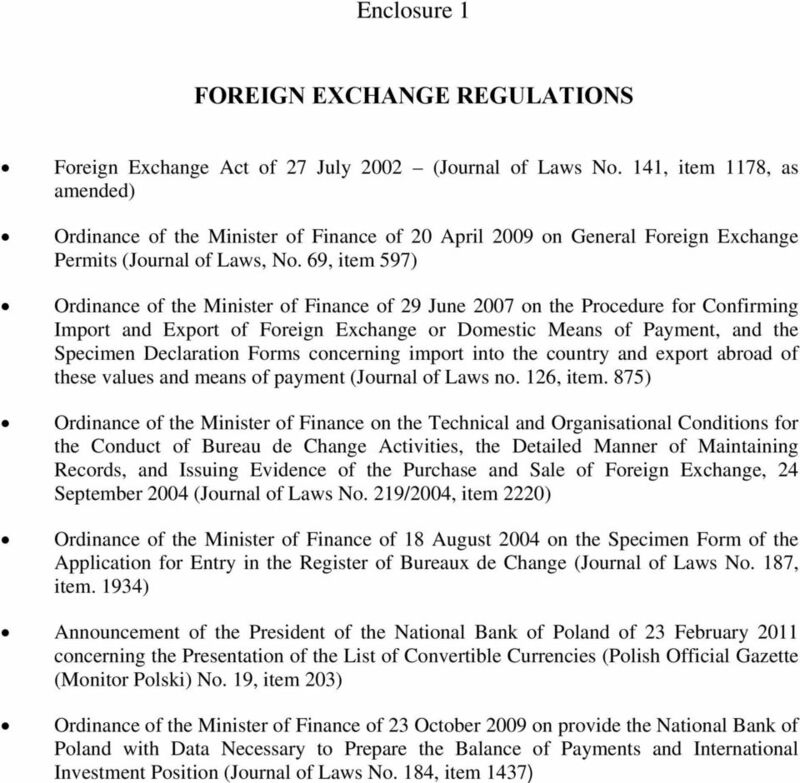 1 RESPONSIBILITIES OF THE NATIONAL BANK OF POLAND RESULTING FROM THE FOREIGN EXCHANGE ACT 1. FOREIGN EXCHANGE PROVISIONS Foreign exchange regulations, which constitute part of the financial legislation, are laid down in the Foreign Exchange Act of 27 July 2002, hereinafter referred to as the Act, and in secondary legislation made under authority contained in the Act (listed in Enclosure No. 1). Legislative initiative in matters of foreign exchange belongs to the Minister of Finance, who is the body competent within the government administration to issue binding interpretations of this law. 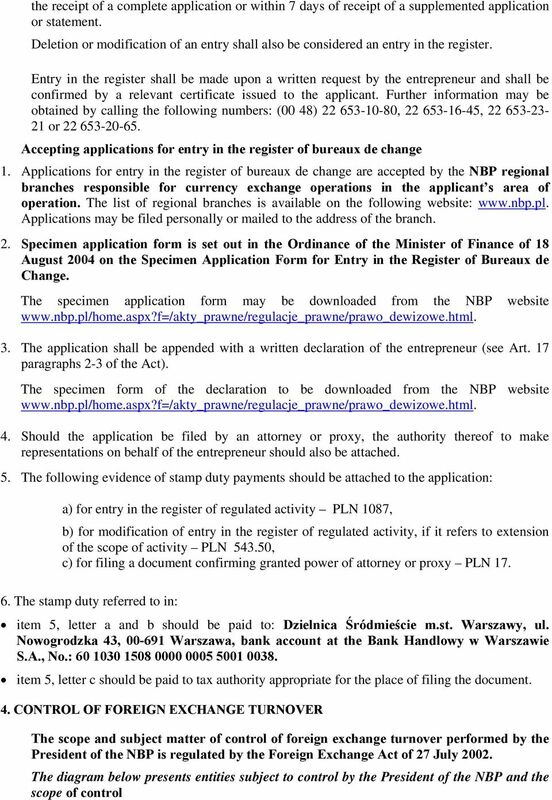 The tasks of the President of the NBP as stipulated by the Act, consist in making decisions on matters connected with: granting of individual foreign exchange permits, maintenance of a register of bureaux de change, performing control of foreign exchange turnover for definition, see Article 2 paragraph 1 points of the Act. 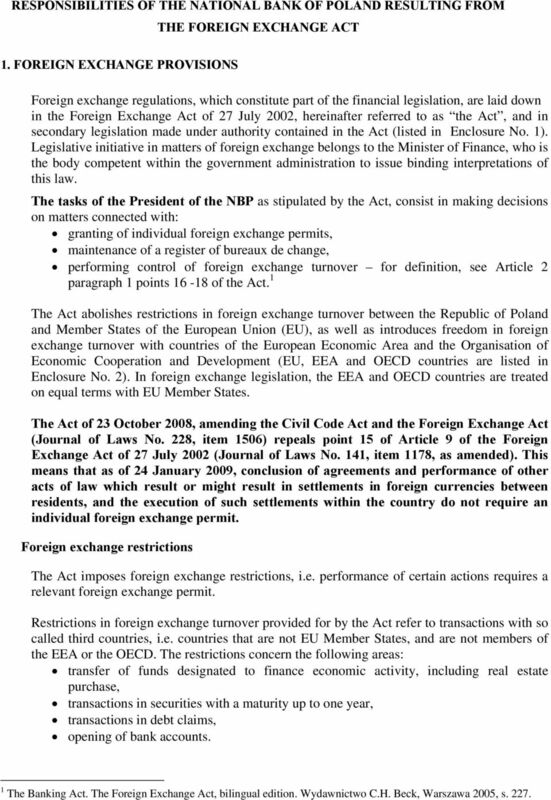 1 The Act abolishes restrictions in foreign exchange turnover between the Republic of Poland and Member States of the European Union (EU), as well as introduces freedom in foreign exchange turnover with countries of the European Economic Area and the Organisation of Economic Cooperation and Development (EU, EEA and OECD countries are listed in Enclosure No. 2). In foreign exchange legislation, the EEA and OECD countries are treated on equal terms with EU Member States. The Act of 23 October 2008, amending the Civil Code Act and the Foreign Exchange Act (Journal of Laws No. 228, item 1506) repeals point 15 of Article 9 of the Foreign Exchange Act of 27 July 2002 (Journal of Laws No. 141, item 1178, as amended). 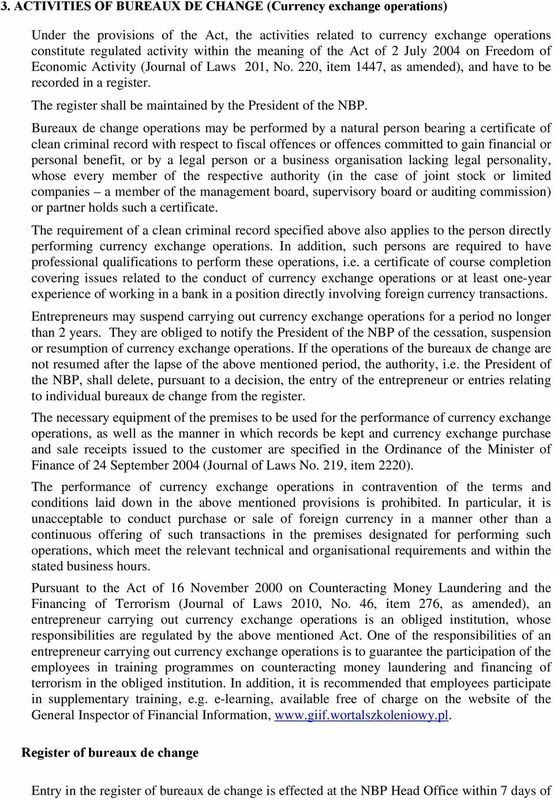 This means that as of 24 January 2009, conclusion of agreements and performance of other acts of law which result or might result in settlements in foreign currencies between residents, and the execution of such settlements within the country do not require an individual foreign exchange permit. Foreign exchange restrictions The Act imposes foreign exchange restrictions, i.e. 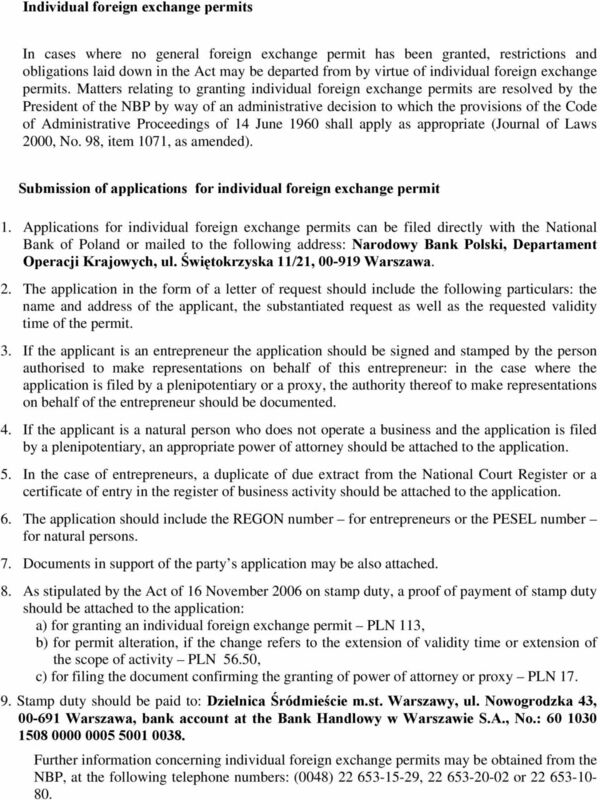 performance of certain actions requires a relevant foreign exchange permit. Restrictions in foreign exchange turnover provided for by the Act refer to transactions with so called third countries, i.e. 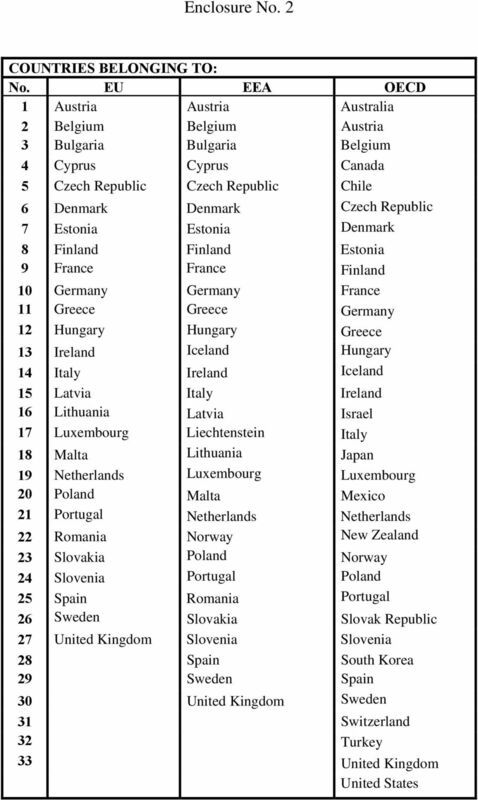 countries that are not EU Member States, and are not members of the EEA or the OECD. The restrictions concern the following areas: transfer of funds designated to finance economic activity, including real estate purchase, transactions in securities with a maturity up to one year, transactions in debt claims, opening of bank accounts. 1 The Banking Act. The Foreign Exchange Act, bilingual edition. Wydawnictwo C.H. Beck, Warszawa 2005, s. 227. 2 Responsibilities imposed by the Act Apart from the above mentioned foreign exchange restrictions, the Act imposes such obligations as: making a declaration in writing to customs or border guard authorities of importation into or exportation from the country of foreign exchange gold and platinum, irrespective of the amount, and of domestic and foreign means of payment, should the aggregate amount thereof exceed the equivalent of EUR 10,000. This obligation does not apply to residents or non-residents crossing borders within the Schengen area; presenting to customs or border guard authorities on demand foreign exchange and domestic means of payment imported into or exported from the country; making international money transfers and domestic settlements in respect of foreign exchange turnover via authorised banks, should the amount transferred or settled exceed the equivalent of EUR 15,000; providing upon the request of the authorised bank information on foreign exchange turnover performed through this bank, in particular concerning the specific purpose of the funds being subject to the turnover; provision by natural persons and entrepreneurs engaged in cross-border foreign exchange transactions as well as those performing bureaux de change activities to the NBP of data required for the preparation of the balance of payments and international investment position; the above mentioned participants engaged in foreign exchange turnover are obliged to store documents relating to the turnover for five years, starting from the end of the calendar year in which the foreign exchange transaction took place or bureaux de change activities were performed. 2. 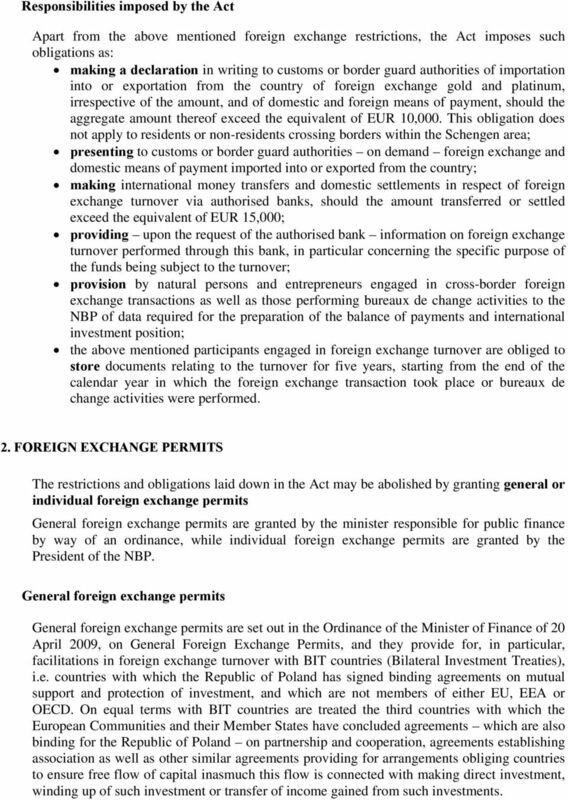 FOREIGN EXCHANGE PERMITS The restrictions and obligations laid down in the Act may be abolished by granting general or individual foreign exchange permits General foreign exchange permits are granted by the minister responsible for public finance by way of an ordinance, while individual foreign exchange permits are granted by the President of the NBP. General foreign exchange permits General foreign exchange permits are set out in the Ordinance of the Minister of Finance of 20 April 2009, on General Foreign Exchange Permits, and they provide for, in particular, facilitations in foreign exchange turnover with BIT countries (Bilateral Investment Treaties), i.e. countries with which the Republic of Poland has signed binding agreements on mutual support and protection of investment, and which are not members of either EU, EEA or OECD. On equal terms with BIT countries are treated the third countries with which the European Communities and their Member States have concluded agreements which are also binding for the Republic of Poland on partnership and cooperation, agreements establishing association as well as other similar agreements providing for arrangements obliging countries to ensure free flow of capital inasmuch this flow is connected with making direct investment, winding up of such investment or transfer of income gained from such investments. Need to send money abroad securely?